Home > News > KC Updates > What’s Happening at New York Comic Con 2016? October 6 update: check out our new license announcements for 2017! In New York October 6 through 9? 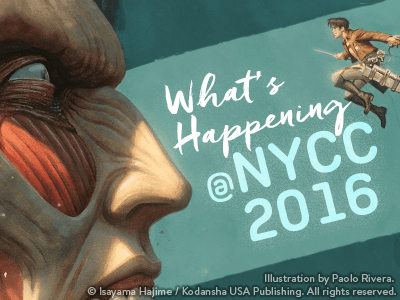 Look for the Kodansha Comics and Vertical booths and events at New York Comic Con! 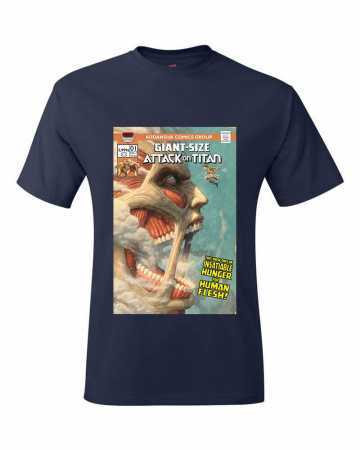 Paolo Rivera (Mythos, Daredevil) is the artist behind the cover of Attack in Titan Anthology standard and exclusive edition debuting at New York Comic Con 2016. 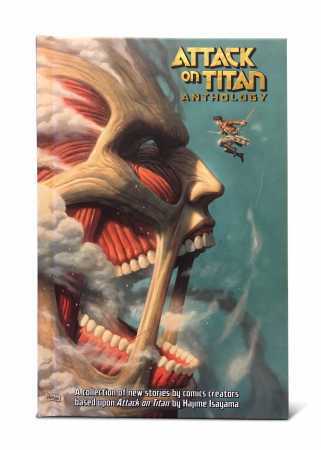 Watch Creator Profile Video on Paolo Rivera talking about Attack on Titan Anthology on Kodansha Comic YouTube channel. We'll be giving away Bakemonogatari posters free at the booth and will have advance copies for sale of Ninja Slayer Part 6, My Neighbor Seki volume 8, Immortal Hounds volume 2, and Ajin: Demi-Human volume 8. New license announcements for 2017 and special presentation on the manga creative process by Kodansha Morning and Young Magazine editor Yasuyuki Mimura. Plus, you'll get the chance to walk away with free books and cool stuff from Japan. See the long-awaited Attack on Titan Anthology for the first time and meet some of the creative team behind this ambitious collaboration between the biggest manga hit of the decade and an all-star roster of comics creators including Scott Snyder, Gail Simone, Faith Erin Hicks, Kevin Wada, Kate Leth, Babs Tarr and more! You may even get your hands on a New York Comic Con exclusive edition of the book! Note: To attend artist signings, come to the Kodansha Comics booth (#2109) get a ticket for the signing.